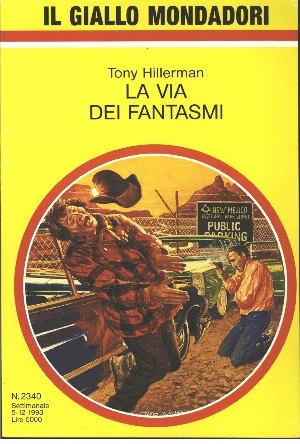 A paperback Italian translation of The Ghostway, the sixth book in Tony Hillerman's Navajo Mystery Series and the third novel featuring the protagonist Sergeant Jim Chee of the Navajo Tribal Police. This edition was published as part of the Il Giallo Mondadori series produced by Arnoldo Mondadori. The series was published weekly and has a two column format. This edition, number 2340, was printed for readership for the week of December 5, 1993 and contains a short biography of Tony Hillerman as the Author of the Week at the end of the book. The book was translated by Mariapaola Dèttore, with the cover design by Prieto Muriana (Agenzia Norma). The cover is a bright yellow with red bands framing an inset illustration depicting a shooting scene taking place in a parking lot with sandstone rock formations fenced off in the background. Format: Paperback, 19 x 13 cm. Binding: Bright yellow paper covers with black-and-white advertisements printed on the inside covers.